To go straight to posts from the new syllabus (2019+), click here. Everyone is welcome to contribute; even if you're unsure of yourself, providing different perspectives is incredibly valuable. Please don't be dissuaded by the fact that you haven't finished Year 12, or didn't score as highly as others, or your advice contradicts something else you've seen on this thread, or whatever; none of this disqualifies you from helping others. And if you're worried you do have some sort of misconception, put it out there and someone else can clarify and modify your understanding! There'll be a whole bunch of other high-scoring students with their own wealths of wisdom to share with you. So you may even get multiple answers from different people offering their insights - very cool. To ask a question or make a post, you will first need an ATAR Notes account. You probably already have one, but if you don't, it takes about four seconds to sign up - and completely free! Hey all! Just doing the rounds and I've realised there is no Question thread for Ancient History! Let's make this the one stop shop for all your Ancient History queries. We've got a bunch of history experts around the forums, including several of our NSW lecturers who smashed the subject. So, pop your questions here and get some detailed answers!! If you want to ask a question, you'll have to register for a FREE account here! I have an ancient history assessment next week focusing on Augustus. I've looked around for resources on this topic, but mostly, Pompeii and Sparta are the subjects with the most focus. The question for the essay is "Evaluate the success of Augustus' reform program." I have two body paragraphs so far on social and political but I am worried if I should try to include religious and military as well. I can show you what I have so far if it's easier. Any advice would be so helpful! FREE HISTORY EXTENSION LECTURE - CLICK HERE FOR INFO! Looking for a history tutor? I'm ya girl! Feel free to send me a PM if you're interested! I am currently studying The Fall of the Roman Republic. For my assessment this term, I have an essay asking me to "Explain the rise and the fall of the First Triumvirate"
My teacher said it read like a description, or a timeline of the events, and I needed to make it more analytical. So I was wondering, how do i go about an "explain" question without using too much description !? I didn't study that topic, but like the question below I can defs still help with structure! The reason it came across that way is you (sort of - see my comments) made a judgement at the beginning that stated that Rome was in a "dire" situation, and that the Roman political order was in chaos, and never really explained it. I can see where there can be a confusion in the wording of the question, but I don't think (in my limited knowledge of this period) that the question would be asking you to explain the chronological occurrences of the rise and fall of the first triumvirate, but moreso the themes that led to the rise and fall of the first triumvirate. "...this is evident through the conflict between Crassus and Gnaeus Pompeius Magnus, whereby the latter took credit for Crassus' military achievements in order to further advance his own political aims and influence... this is further established through Pompey's personal desire for land for his veterans, which resulted in a conflict between himself and the Senate, further contributing to overall political turmoil that defined the period, and led to the rise of the First Triumvirate"
Does this make sense (please let me know if it doesn't and I'll try and explain further ? Also just another point, but your paragraph came across a little bit like a shopping list of historians. Historians are great! And the way you introduced a lot of them was smooth, but that is the thing... you mention A LOT of them. I think sometimes it would be better to maybe forget to use a quote here or there and instead explain why YOU feel a certain way, rather than just parroting a historians opinion. I hope this helps/makes sense! A bit tricky when I haven't studied the topic. There were defs some instances where I was not sure if they were relevant to your argument when they absolutely might have been! In the end it is up to you to make the call but hopefully this gives you a bit of a leg up! Thanks so much Susie, you comments really helped a lot! I'm going to try link back to the overarching question more and make all my info relevant so it doesn't read like a timeline. ... Also cut down on historians ! Hi Susie, can you check my intro/paragraph structure and whether I am using my quotes effectively etc. At a time when Rome was in political upheaval, three most ambitious men joined together in a political alliance with aims to overthrow the Senate. In 60BC, Julius Caesar, Gnaeus Pompey and Marcus Licinius Crassus were fuelled by the desire to further their own personal successes that had become stagnant due to the Senate’s rejection of their requests. While their initial successes came from collective support and trust in one another, later tensions and jealousy between the men brought the First Triumvirate to an inevitable end. The First Triumvirate was formed under the Senate’s disagreement with Caesar, Pompey and Crassus. Roman historian Titus Livy described the coalition as “conspiracy against the state,” where the three men were united by their common hatred towards the Senate for preventing them from further political success. According to Scullard, Pompey wanted the senate to approve his “double request that his eastern settlement should be ratified...land provided for his veterans.”While this request was highly common among successful military leaders, Appian notes, “A number of senators were jealous” and rejected his demands, perhaps due to Pompey’s unconventional escalation to power despite his young age. As Pompey was a highly ambitious man who constantly desired more power, he was compelled to join the Triumvirate in order to overturn the Senate’s decision. The Senate had been wary of not only Caesar’s popularity with the people, but also as Suetonius suggests, “he was suspected of having made a conspiracy with Crassus,” hence making it increasingly difficult to be elected as consul of 59BC. Similarly, Scullard argued that Crassus’ supporters had been ‘economically raped’ during the Mithridatic Wars and in order for him to regain their respect, the Senate needed to grant compensation for the tax collectors. However Crassus’ request was also denied, causing him to turn to Caesar for help in fulfilling his promises to the people. Thus, the formation of the First Triumvirate was the three men’s reaction to the Senate’s rejection of their various commands. Hi Susie, can you check my paragraph structure and whether I am using my quotes effectively etc. The First Triumvirate was formed under the Senate’s disagreement with Caesar, Pompey and Crassus. Judgement? Your first sentence MUST always be a judgement, not just an explanation or description. Remember that this is an essay and not a narrative or outline, therefore you must construct an arguement. For example, (as someone who hasn't studied the unit and is basing this entirely around this statement), an effective judgement could look like - 'The formation of the first Triumvirate was primarily due to the Senates conflict with the three leaders, Ceasar, Pompey and Crassus. - This may look like I just said the same thing, but wording is important here, particularly the use of "primarily due to" - that is where the judgement is. Roman historian Titus Livy described the coalition as “conspiracy against the state,” where the three men were united by their common hatred towards the Senate for preventing them from further political success. Nice explanation and integration of quoteAccording to Scullard, Pompey wanted the senate to approve his “double request that his eastern settlement should be ratified...land provided for his veterans.” Was it really necessary that Scullard says this? Couldn't you just say it yourself in your own words? I always try and keep my use of historians to providing and justifying judgements, not for an outline or description of an event or factor. It just doesn't really add anything to your argumentWhile this request was highly common among successful military leaders, Appian A lot of historians in a very short amount of time notes, “A number of senators were jealous” and rejected his demands, perhaps due to Pompey’s unconventional escalation to power despite his young age. As Pompey was a highly ambitious man who constantly desired more power, he was compelled to join the Triumvirate in order to overturn the Senate’s decision. The Senate had been wary of not only Caesar’s popularity with the people, but also as Suetonius suggests, “he was suspected of having made a conspiracy with Crassus,” hence making it increasingly difficult to be elected as consul of 59BC. Similarly, Scullard argued that Crassus’ supporters had been ‘economically raped’ a much more effective use of a quote during the Mithridatic Wars and in order for him to regain their respect, the Senate needed to grant compensation for the tax collectors. However Crassus’ request was also denied, causing him to turn to Caesar for help in fulfilling his promises to the people. Thus, the formation of the First Triumvirate was the three men’s reaction to the Senate’s rejection of their various commands. First of all, I highly doubt you'd get an "Explain..." essay question in the HSC, as that is a lower order question in comparison to "Assess", "Evaluate", "Justify" or "To what extent." You can get this type of question as a short answer in Section I and II, or for part A of Section III, but never for a Section IV essay. Given how unlikely this is, I have been a bit tougher, and marked according to a structure that I believe will maximise your marks in the HSC. As an explain question, your response is pretty good There is an overload of historians, but overall you have explained the event well and in detail Just make sure that your response is centered around your own understanding and judgement, rather than that of a historian. They shouldn't be the driving force behind your essay, but just as supplementory detail and justification for your own points. As Pompey was a highly ambitious man who constantly desired more power, he was compelled to join the Triumvirate in order to overturn the Senate’s decision. The role of this senetorial conflict in the formation of the First Triumvirate is further evident through Pompey's attitudes towards power, whereby he was compelled to join the Triumvirate in order to overturn the Senate's decision. If I could "like" this 10 times I would, your feedback is so good I want to cry!!! THANK YOU! Aw thank you! This makes me really happy, so glad that you found it helpful! In terms of the amount of historians, I don't really think that there is a definitive answer here. Though historians are comparatively more important in Ancient than in Modern History, its not really the fact that they are historians that is important, more that they are evidence. You DO want to be consistently using evidence to back up your points, and should really be used to back up almost any point you make. However evidence doesn't just encompass historians, but also archeological sources, statistics, etc. etc, and IMO archeological sources in particular are even better to use than historians! For example when I studied the Julio-Claudians, instead of using a quote from Scullard or Tacitus to suggest that Claudius' reign was dominated by the influence of Agrippina the Younger, I would specifically reference archeological evidence such as numismatic and statue depictions, that place her on an equal level to the Princeps (which was pretty crazy!). Hi Susie, I have another question regarding the 'explain' question I had. Is there another way to include a judgement in the topic sentence without always saying it was "due to"? Do you mean another way to phrase the statement "The formation of the first Triumvirate was primarily due to the Senates conflict with the three leaders, Ceasar, Pompey and Crassus"? "due to" --> "a result of", "contributed by", etc. etc. If you're asking this question though in regards to varying your sentence formation throughout your response, you don't need to worry I know in English they can get really pissy over language choices, but when it comes to HSC history they really don't mind, and in my opinion its actually better to use consistent wording throughout, as it gives the marker less opportunity to see a split judgement (which you want to avoid at all costs!). Hi Susie, could you mark my essay please? Also, I know you didn't study my topic, but for the 'roles' part in para 3, would I have to go into specific details or is what I'm doing still ok? 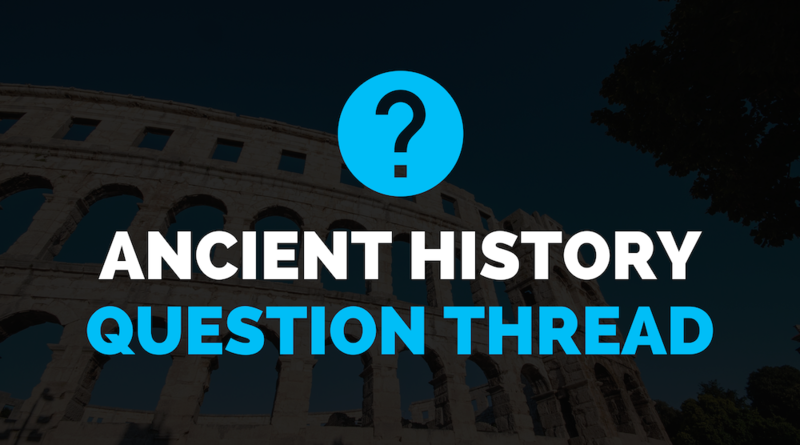 Explain the formation, role and breakdown of the First Triumvirate. The formation of The First Triumvirate was primarily due to the Senate’s disagreement with Caesar, Pompey and Crassus. Roman historian Titus Livy described the coalition as “conspiracy against the state,” where the three men were united by their common hatred towards the Senate for preventing them from further political success. Pompey’s rejected requests were according to Appian, due to the senators’ jealousy which was perhaps brought about by Pompey’s unconventional escalation to power, in particular his position as consul of 70BC despite his young age. As Pompey was a highly ambitious man who constantly desired more power, the senatorial conflict compelled him to join the triumvirate in order to overturn their decision. Similarly, Crassus’ supporters had been impacted by the Mithridatic Wars and in order for him to regain their respect, the Senate needed to grant compensation to these tax collectors. However Crassus’ request was also denied, causing him to turn to Caesar for help in fulfilling his promises to the people. The Senate, however had not only become extremely wary of Caesar’s popularity with the people, but also as Suetonius suggests, “he was suspected of having made a conspiracy with Crassus,” hence making it increasingly difficult for him to be elected consul of 59BC. Thus, the formation of the First Triumvirate was the three men’s collective reaction to the Senate’s rejection of their various commands. The three men’s inclusion in the First Triumvirate was largely due to Caesar’s strategically built alliance whereby he combined Pompey and Crassus’s wealth and prestige to further his career and subsequently, theirs. Crassus was not only a friend of Caesar’s who had financially supported him in his previous position as Pontifex Maximus, but according to Sallust, “Tarquinius named Crassus, a noble of great wealth and of the highest rank.” Caesar clearly saw the benefit of inviting such a man into the alliance as he himself, had no wealth to gain him the power to the extent that he desired. Pompey on the other hand, was the most successful military general as verified by Appian in “gave him command of all forces...never been given to any one general before.” It is likely that Caesar saw that Pompey’s loyal veterans could ignite fear in the Senate – forcing them to abide by the three men’s wishes – hence he was also invited into the liaison. Hence it is evident that Caesar knew “without the aid of both...he could never come to any great power” (Cassius Duo). As such, Caesar extended the invitation to Pompey and Crassus to support him in his consulship in return for passing their rejected requests, and granting them commands over promising provinces. It was largely due to Caesar’s later role as sole consul of Rome which aimed to surpass the power of the Senate to maximise the political careers of each man. Caesar’s strategic and power-hungry nature enabled him to push for illegal reforms that benefitted the members of the triumvirate. Yet the people’s approval of his bills was a result of his threatening actions as noted by Plutarch in “[Pompey] filled the city with his soldiers,” hence suggesting that the men used unconstitutional force to ensure that their laws were passed. This further confirmed the powerful role individuals played when they were backed by military strength, allowing them to force the Senate into inactivity. While this abuse of power contributed towards the men’s attainment of increasing military commands, it also interfered with Rome’s political climate. This is supported by modern historian Matthias Gelzer who argues that the men only considered “personal interests without regard for the organs provided by the constitution.” As a result, it is evident that the combined strengths of the men and their dynamic personalities enabled the First Triumvirate to become significant for its role to challenge and overturn the Roman constitution. Although Crassus’ and Caesar’s daughter’s deaths were two reasons for the breakdown of the first triumvirate, ultimately it was due to the uneven strength of the three men which caused irrevocable political tensions. Caesar’s victories in Gaul created jealousy among the two other powerful men, hence threatening the unity of the coalition. It is also highly likely that Caesar’s method of passing Pompey’s previous agrarian law which according to Plutarch, “brought Pompey out openly in front of the people,” led the tribunes to believe that Pompey was hostile. This in turn, provoked Pompey’s resentment towards Caesar as he began to lose the people’s respect. Modern historian Christina Boggs similarly argues that the “insatiable thirst for power” suggests that while the political alliance was a mutual agreement, each man sought to achieve more popularity and power than the other without regard for their initial political agreement. This is reiterated by Suetonius who commented “he [Caesar] did very much as he pleased,” hence contributing to the rivalry between himself and Pompey. As a result of the arising jealousy, the later events of Julia’s and Crassus’ death cemented the end of the alliance. Plutarch confirms this in “could not satisfy the ambition of two men...they who were only two.” Since Julia served as the glue that forced Pompey and Caesar into a civil relationship, her death served as a catalyst for the inevitable collapse of the First Triumvirate. Ultimately, the formation of the First Triumvirate was due to the Senate’s disagreement with Caesar, Pompey and Crassus which fuelled their desire to surpass their laws, and the Roman constitution itself. However, what once was a collective desire for success and power, was outweighed by each member’s personal interests to further their own reputation in the political arena. As such, jealousy towards another man’s popularity sought to break up the ‘triumvirates’.